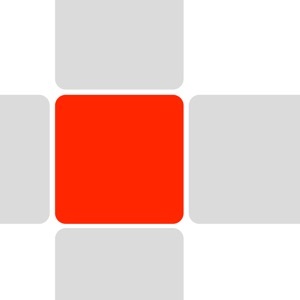 EvenBetter is a relaxing mathematics puzzle game. There are no timers, no ads, no fuss. Rules: - The player is presented a gameboard of 4 x 4 squares, surrounded by 16 complementary tiles - The game start with all squares set to 0 and complementary tiles with random numbers from 0 to 9 - Each round, every square on the grid has its value added to the four neighbouring squares/tiles and its value is replaced with the last digit of that sum. 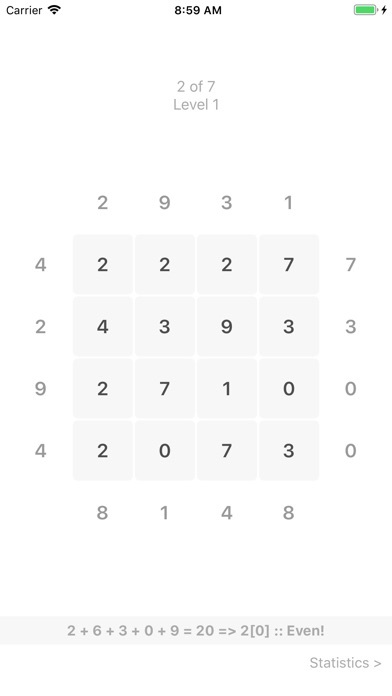 - You have to figure out which square will have an even number on it next round. - The complementary tiles on the sides are randomly generated every round, so every round is unique. - The game guarantees that there is always at least one possible choice. - A round ends when the player makes a choice, values are then computed and a new round starts. 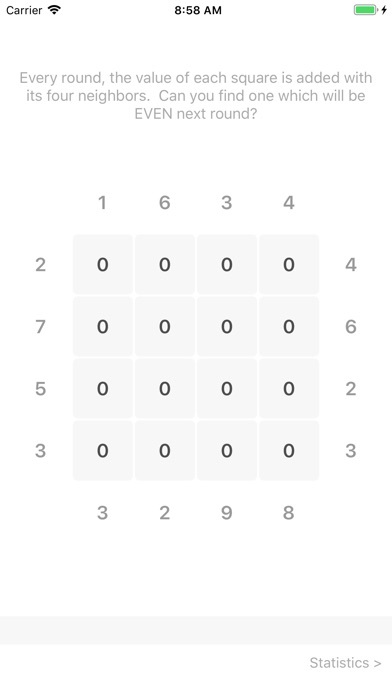 - Selecting a square producing an odd number at the beginning of a round will end the game early. - There are no time limits. 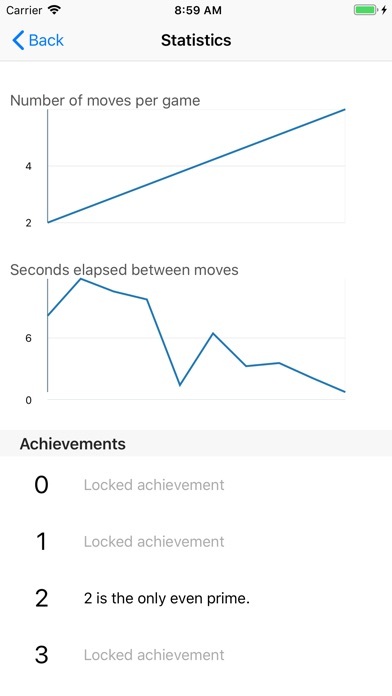 - The game ends when the player successfully reach the end of level 5 (83 rounds) Fun facts: At the end of each game, the player is presented with some properties of a number. 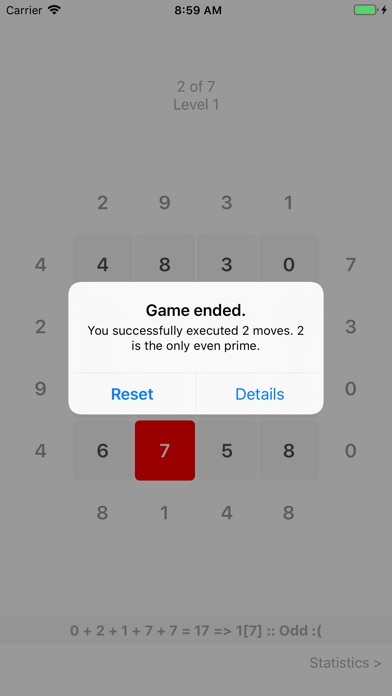 For example if the player successfully completed 2 rounds, a fact about the number 2 will be given (2 is the only even prime number!). If a player completes all 83 rounds successfully, a bonus fun fact will be unlocked. School teachers/parents: This game links to external content on MathWorld and a few entries on Wikipedia explaining what some properties of numbers are, such as Mersenne prime, non-trivial values, etc -- knowledge of those topics is not required to play the game. Statistics/Metrics: Because this game is all about numbers, it would not be complete without some statistical analysis. Do not worry, your privacy is extremely important to us. This application is self contained and will not share player usage statistics to any server. Any and all statistics are entirely stored and only stored on the device for player review. **Apple may record application usage statistics as per the privacy settings indicated by the device owner.